Thank goodness today is a new day because yesterday...well, yesterday sucked. It started out good, I was in a fair mood as the morning rolled along. I finished up an appointment out in the field and was hungry for a snack but hadn't packed one. That's when things started to go downhill. I bought a bag of Fritos at a convenience store. I noted there were 4.5 servings in the bag and I was nervous I'd eat the whole bag so I offered some to the young vagabond sitting on the curb outside. After sharing half the bag with him I felt a little safer with closer to 2 servings of Fritos. But those chips got the ball rolling and like I said, all downhill from there. I got back to my office and the munchy feelings remained. I opened a box of Girl Scout cookies that had been in my office for possibly as long as a year. No, they were not thin mints (I'd probably feel better if they were), they were lemon, Savannah Smiles. Don't get me started on the name. I started eating them while doing some data entry and next thing you know, there were only two left in the box. Yep, I ate ALL of them. I felt a little disgusted with myself. I ate the second-to-last one and then refused to eat that last. damn. cookie. I threw the box away and went to the cafeteria for lunch. Of course I wasn't hungry after all those cookies but I ate anyway, feeling a mixture of anger and sadness (which I think are the same emotions really). My mood only worsened as the day went on. I started to hope there was a hormonal explanation for both my feelings and my eating but so far, no indication of that. To make matters worse I didn't feel like going to the gym. But I knew, I KNEW, that was my only hope for a better mood. I walked in the door and there was Glen. The health gods were smiling on me to put him in my path. He understands all this food-junkie insanity and he asked if I knew why I did it, "Yeah, I know." Good enough, carry on. I changed into my workout clothes and noted my sore legs and back. But I didn't care how my body felt, I knew I needed to run. I got on the treadmill and started out at 6.3mph. I'll spare you all the details and just say I forced myself to run 7.3mph intervals despite how my legs felt, and I managed to do all but one. By the time the last interval rolled around my legs were on the verge of collapse. Know your limits, this isn't punishment, you want to be able to walk tomorrow, were all things I told myself. I wish I could tell you the running fixed everything but I was still feeling crappy when I started in on my strength training, chest/triceps/core. I wasn't sure I would be able to do 20/15/12 reps of pushups in three sets respectively but I did. As I moved through my routine I started to feel a little relief, the anger subsided some. At one point I set some dumbbells down with a little more force than was necessary and something about that act helped. Maybe what I really needed was a punching bag. I did my stretching/cooldown. As I was leaving, Glen asked if I was feeling better, "a bit less self-loathing anyway." Oh the drama. How can you stand it? I also wish I could tell you that I ate clean the remainder of the day to offset the high calories but that was not to be. 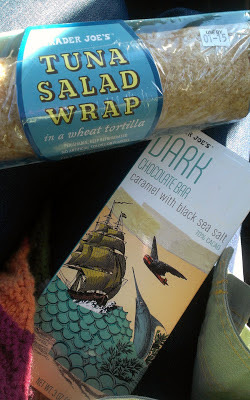 After dinner (a bowl of Kashi GoLean and a few bites of pasta) I went grocery shopping and - the wheels on the bus go round and round (or they just fall the hell off) - I picked up a dark chocolate/caramel/sea salt bar. I ate three squares of it (a bit less than half) and threw the rest away. Must I write this all down? Can't I just pretend I'm not this out of control? Then I wanted something salty. So I picked up a bag of Fit Popcorn to take home, thinking that would be a decent thing to munch on while Miguel and I watched another episode of Game of Thrones after the kids were in bed. Fortunately he ate half the bag. And Game of Thrones is gooooood. Well, there you have it. I've laid it all out - my imperfection, my neurosis - and despite having kept this blog for going on six years now, it's still embarrassing. When will I be perfect? Or maybe the better question to ask is, when will being imperfect be ok? Glen pointed out that the whole box of cookies was 700 calories and that in the big picture, 700 calories won't make or break me. And then there are the Fritos, and chocolate, and popcorn...but whatever, one day, no matter how much I eat, won't break me. It's my response to it, my feelings about it, my judgment of it - that's the damage. As I was driving home Joss Stone's Right to be Wrong came on. That's when I realized I'd been feeling this irrational rebellion. Against who? What? As if anyone else gives a crap what I eat. But I know it's not about food. It never is, right? The food is just a way to avoid, distract...nothing to see here, I'm fine. So today I will aim to sit with my feelings. I feel better than yesterday, owing to the fact that it's a new day and a new opportunity to live my truth. Today I will strive to be. Just be. p.s. I forgot to pack a snack again today. I'm going to buy an apple and have that and a string cheese with my vitamins and water. Later I'm going to the gym to ride the bike and lift more weights (back/biceps/core). Just the thought of following my routine makes me feel all warm and fuzzy inside. I agree that anger and sadness are nearly the same. I hate the snowball effect. Hang in there. I'm with you, Drazil - the snowball effect is predictable (sometimes) and (always) horrifying for me. Why is it so hard to STOP once I've STARTED? What IS that? I get the same way. I just want to growl, snarl and bare my teeth when I lose my control. You know I think this kind of stuff pretty much happens to most of us. I remember one night a few years ago when I just couldn't stop eating. It was my emotions that I was trying to stuff with food and man I was just a bottomless pit. I think binges like this proves how we respond on a chemical level to processed foods. Who has ever had a bowl of cherries set off an eating binge? Glen sounds great. I've had my own struggles with emotional eating lately, so thanks for being honest enough to post this. Your honesty when it comes to days like this is always encouraging. It's right up at the top of the page every day, right? "Striving to STAY NORMAL." Days like this are UNUSUAL (for any of us, including you) but it's not ABNORMAL. When it happens, we're not proud of it, but we keep moving on and get. back. on. track. (And hopefully, deal with whatever triggered it as well!) Hope today was a MUCH better day. Instead of focusing on your actions yesterday, it's a good idea to focus on why they happened in the first place. Then, instead of fighting the urges to eat a box of cookies (which is something i think we have all done in our lives), the focus is on putting proper plans into motion to prevent the urge in the first place. I applaud you for not waiting until Monday to start up again. You work up this morning and got right back into your plan of attack! Thank you for your blogs. This is my first comment but I have been enjoying your posts. I recently had a spate of days (three, actually) during which I just. did. not. want. to eat right. I was feeling out of control and very bummed about it - did not *want* to stop and was starting to feel some desperation about the out-of-control feeling. Then during a break at work when I sat and watched some trees in the wind, it suddenly occurred to me in a kind of Zen-like realization, that everything about that moment was just right and just as it should be *including* my lack of desire to control myself. Very shortly after that, for some reason, the compulsion to eat just ended on its own - I did not have to do anything or try anything special - it just ended on its own, possibly because for a few moments I had stepped of the spinning exercise-wheel of self-hate, who knows, but I came to my senses without trying to force myself to come to my senses. Thank you for your post and your honesty - I think we can all learn and benefit from such stories.